Hydrawise Controllers operate your sprinkler system much the way traditional controllers do, but with one smart addition: the controller is connected to the internet to automatically adjust watering schedules based on forecast temperature and rainfall. Automatically adjust your watering depending on local weather conditions. Experience a 50% average water savings compared to a controller with a fixed schedule. A HydraWise irrigation controller can use local weather stations and forecasts to automatically adjust the watering times of your irrigation zones based on your local weather conditions. Use your smartphone or computer to access Hydrawise’s easy-to-use app. You decide how much water your garden needs, and Hydrawise will take care of the rest. Unlike others, you don’t need to perform any complicated port forwarding on your router. Let your garden thrive without wasting precious water. Hydrawise waters more when it’s dry and less when it’s wet, so your plants always have the right amount of water. 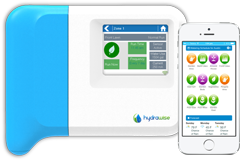 TriState Water Works is an approved irrigation contractor with Hydrawise, and we’d love to discuss this smart controller with you.